Tribute Longjing Tea - Which Is Real? For the first time I visited what is probably the most exclusive tea shop in Sweden. 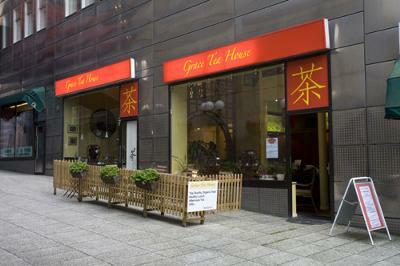 Located in central Stockholm, it has both a tea shop, a small lunch restaurant, and also tea ceremony with a tea master. Grace Tea House sells teas from China. Mrs Grace, to whom I spoke in length, is from West Lake, and her English is good but her Swedish is not that good, which makes me glad as I like to speak English and now that she is a real Chinese. I also bought a cup of afternoon tea. 6 euros for a cup of Tribute West Lake Longjing tea she served me gongfu style together with some green cookies. Two grams in a 100ml glass tea cup she used. 4 infusions it was supposed to last. I did 3 infusions. A good tea. Very good actually. 50 grams is about 25 Euros. In a metallic can. From freezer she said. We talked mostly about Tribute West Lake Longjing tea. She said something very persistent about it. Tribute West Lake Longjing tea is a brand name and this tea has received this label guaranteed origin by the Chinese government in cooperation with the EU. Tribute West Lake Longjing is the only Longjing tea that has received this label. Tribute West Lake Longjing tea is grown in an area of about 168 km^2 in Hangzou in easter China. The tea bushes are all grown organically. Tribute West Lake Longjing consist of one bud an two leafs in is picked early spring. Do you know anything about this brand and label? Is your Longjing tea also a tribute West Lake Longjing tea or is the word tribute used loosely? Hey, thanks for sharing with me your wonderful tea experience in Grace Tea. Tribute Longjing tea is a confusing term and so I am happy to clarify here again. The word Tribute means Gong, which in Chinese means stuff that is offered to emperors as gifts. In the old days, the best tea gardens in the original West Lake (much smaller than the 168 kilometre squares that you mention) bear the Tribute seal - i.e. they provide the Chinese White House (Zhongnanhai, or Middle South Sea) with tea. These tea gardens all locate on top of the Lion Peak Mountain (Shifeng Shan). HQ's tea gardens are amongst the tribute tea gardens. However, legally speaking, the word tribute now refers to the trademark which is owned by a Chinese company. As far as I am aware, West Lake tea plantations are owned by the 3000 small farmers, and 4 Chinese companies currently source their teas from these small farmers. Tribute Dragonwell tea can only be found in the top shelf of reputable, well-connected tea shops. At present, only two online vendors stock it. Sevencups do one for $72.90 per 50 grams. Although it costs twice as much, it is the most comparable to HQ's, as both come directly from the same village. Teaspring's is a company trademark rather than a true tribute tea garden. West Lake is dominated by household tea gardens. Tea companies do not own any estate. They are middle-men with a brand.